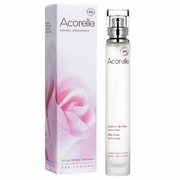 Acorelle Perfumes Eau Fraiches Silky Rose 1 fl. oz. Home > Natural / Organic Products > Natural / Organic, Hair, Skin Care Products > Body Mists Fragrances and Perfumes > Acorelle Perfumes Eau Fraiches Silky Rose 1 fl. oz. A light refreshing spray evoking a fresh bouquet of flowers with top notes of rose and geranium as well as fruity facets such as raspberry. Definitely a fragrance with a feminine charm, Silky Rose has an aromatherapy aspect of harmony. French Floral Water—made with organic alcohol and 100% natural fragrance materials. No synthetic fragrance. No phthalates. Ingredients Organic Alcohol 80% vol., water, fragrance.